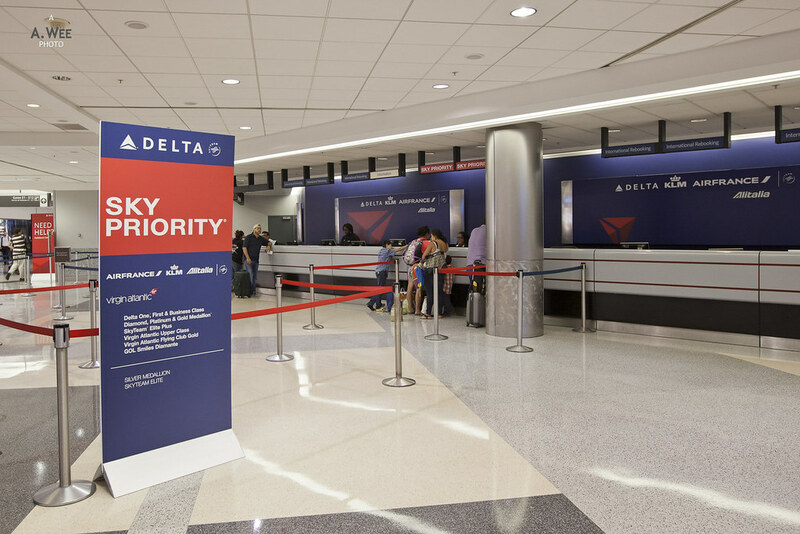 Atlanta is Delta’s major hub and the airline is so huge here that there are several SkyClub in the airport itself. 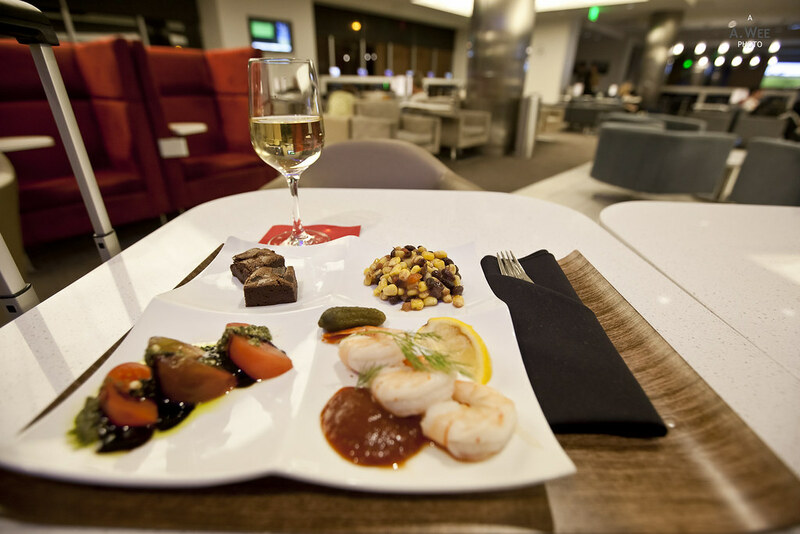 Once I got off my flight, I head to the nearest SkyClub in Concourse A. This allowed me to check with the reception on the departure gate for my next flight and she even recommended me to head to the SkyClub in Concourse E.
The Sky Club in Concourse A is close to gates A17 and has the consistent branding on entrance. 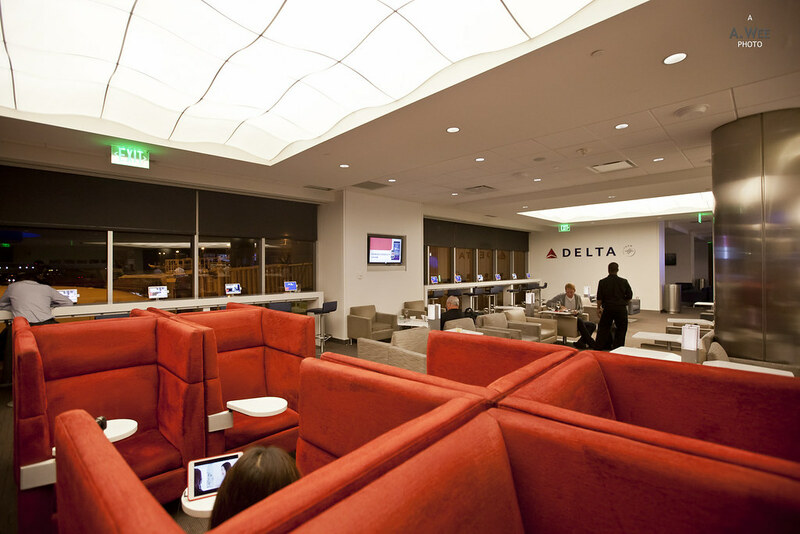 Ever since my first visit to a Delta Sky Club in Los Angeles, I became a fan of the airline. 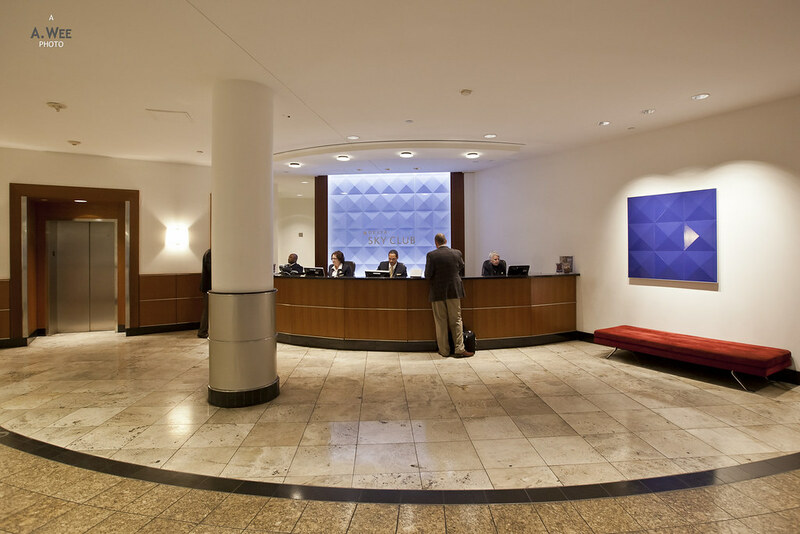 While there wasn’t an art gallery in this lounge, the entrance was as stylish with the cool blue backlighting. And the agents were as professional too while checking me into the lounge. 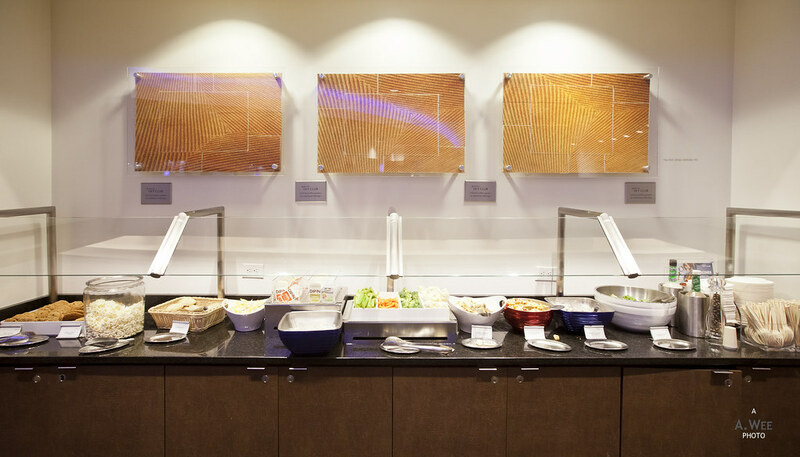 There is a small buffet counter on the side after entering the lounge with a large seating area. There is a disabled-friendly pathway to an upper tier that leads to the bar area with more seats. On the upper section, there is also views out towards the tarmac. I did not spend much time exploring this lounge and instead took the shuttle train to the E concourse, as it was nearest to my departure gate and has the shower rooms I needed. 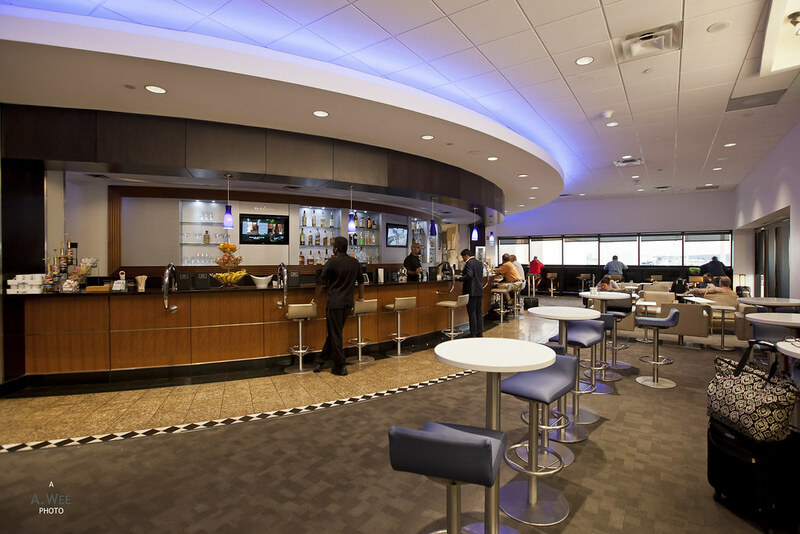 First impressions of the Sky Club on the E concourse was that it was definitely more modern in terms of decor. It feels more similar to the one in Los Angeles. Of course the first thing was to request for one of the shower rooms and I was directed to the other end of the lounge. I passed by a kind of relaxation corner with dim lighting and comfortable loungers with footrests. 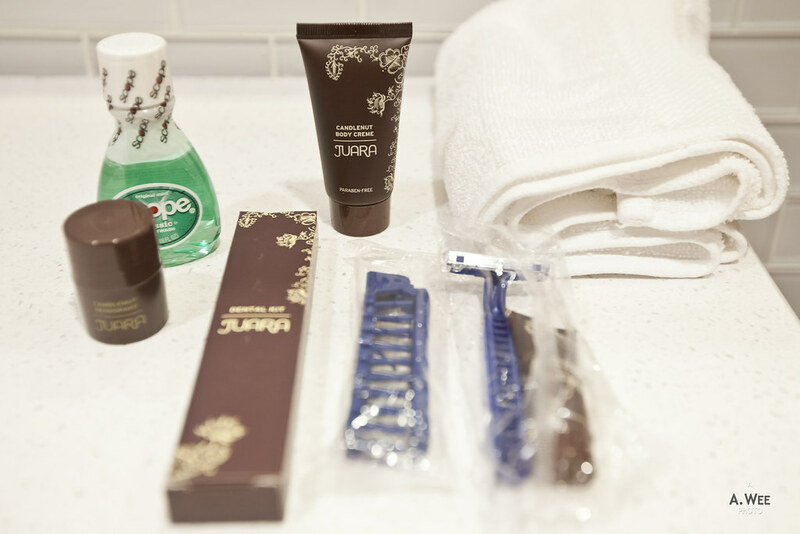 There is another receptionist by the desk and I had to pass to her my boarding pass, while she handed me a shower amenity that included some neat amenities like a comb, deodorant, mouthwash, toothbrush and shaving kit. 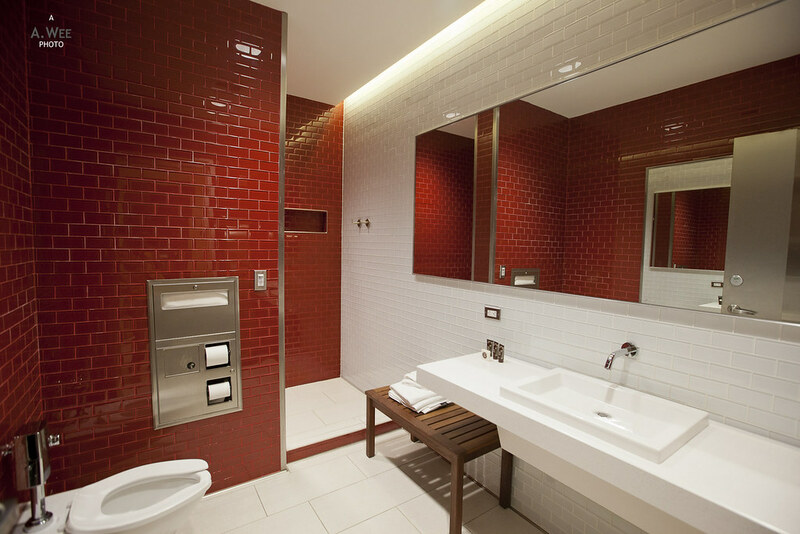 Inside the individual shower room itself, there are additional bath gel, soap, shampoo and body lotion. The decor of the shower room is bright and it is one of the most spacious I have been to. The shower compartment is separated by a wall, allowing guests to bathe without causing too much of a mess and it is brightly lit. There is a wooden bench by the side which is large enough to place a backpack and a cabin size carry-on luggage. 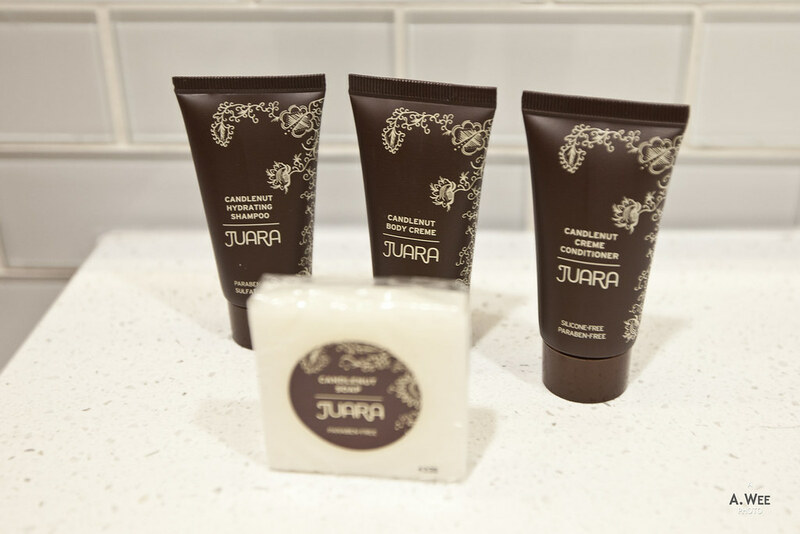 Amenities provided are ‘Juara’ branded and is quite nice to use. I also liked the fact it was paraben-free. After a refreshing shower, I head back out to the bar to grab some mineral water and requested some soda from the bartender. Then I went back to get a seat and called for an attendant. Passengers travelling on Business Class to international destinations are provided the ‘Delta ONE’ treatment. 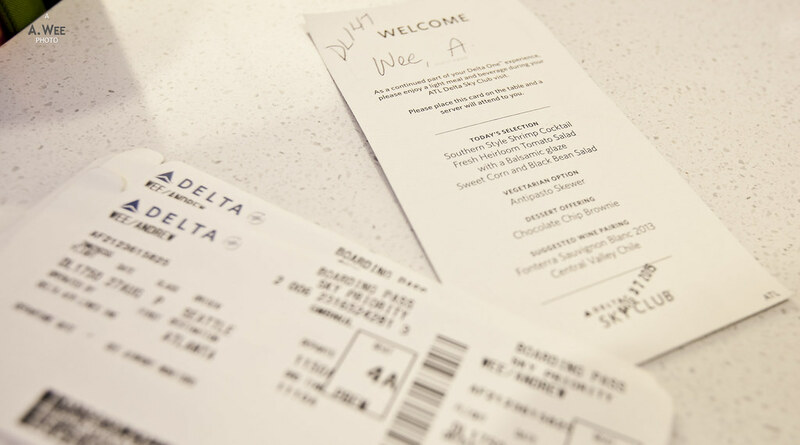 That includes a menu from which passengers could order some food from. This menu was provided upon checking into the lounge. The selection for that day includes a tapas plate consisting of Southern style shrimp cocktail, fresh Heirloom tomato salad with a balsamic glaze, sweet corn and black bean salad and a dessert of chocolate chip brownie. There was also the vegetarian option of an antipasto skewer. A suggested wine pairing was included with the light bites and the wine that day was the Fonterra Sauvignon Blanc 2013 which happens to be a Chilean white wine. While the presentation of the snack was immaculate, the dishes were hit and miss. The shrimps is not likely to make people complain but the colour of the tomato was a bit off. The corn and bean salad was probably something that came out of a jar from Trader Joe’s. The brownies were also probably off the shelves, but combined, they actually make a decent serving that I can’t complain. At least Delta tried to make it work by supplying some differentiated catering for the premium passengers. 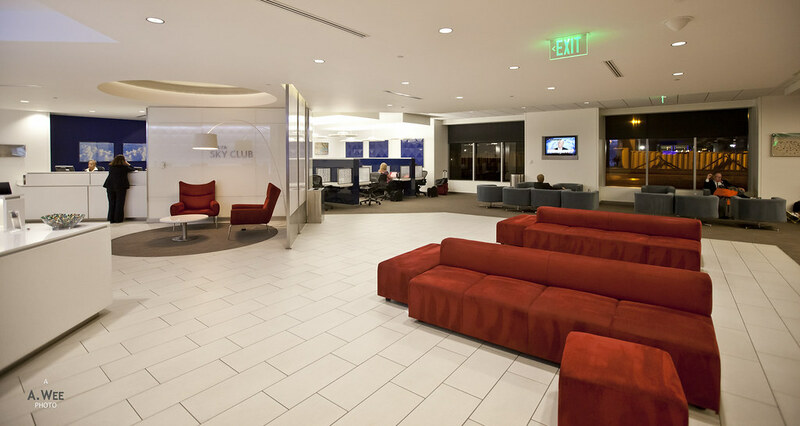 The rest of the Sky Club cannot really be faulted. There was good wifi connection, a lot of seating space since the Sky Clubs seems to be quite empty in the evening. The ambience was also pretty quiet ensuring most passengers could get some work done if they so wish. 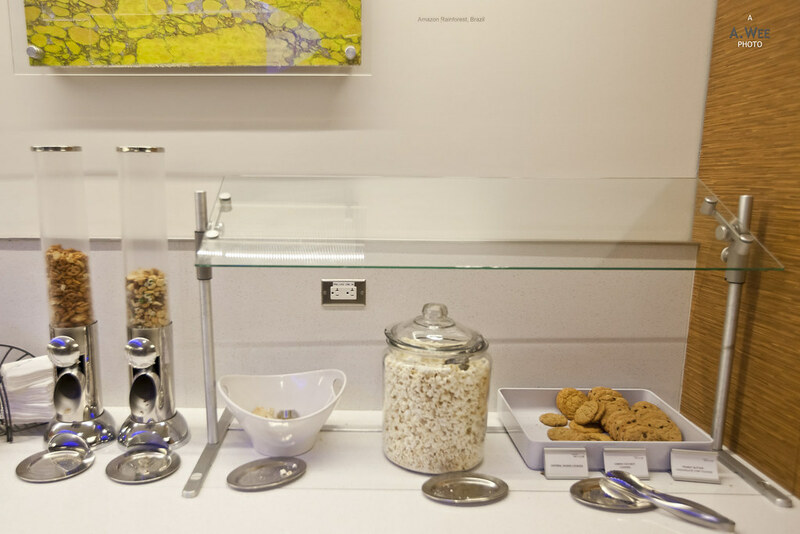 Finally, guests who are still not filled by the light bites provided could also help themselves to assorted cookies, and popcorn or soups, bread and cut vegetables from the buffet counter. 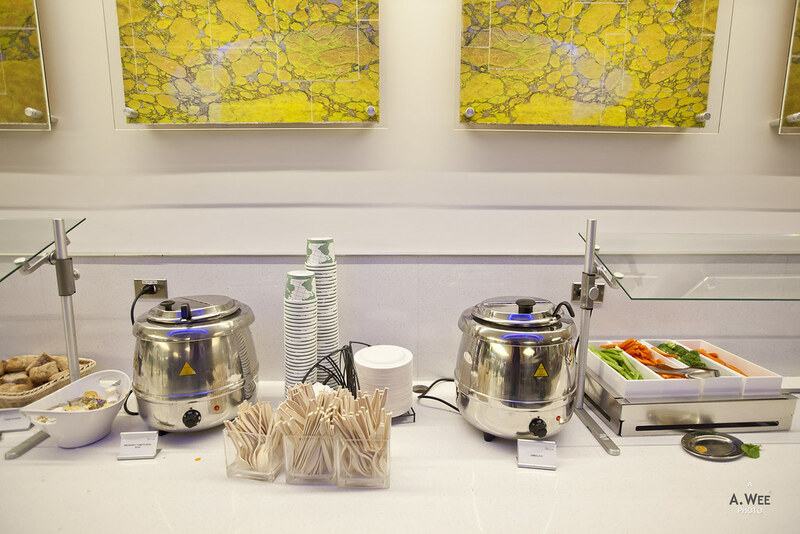 For the hub airport lounge, I was expecting some special lustre from Delta but it seems the lounge offering was standard like most of their other lounges. 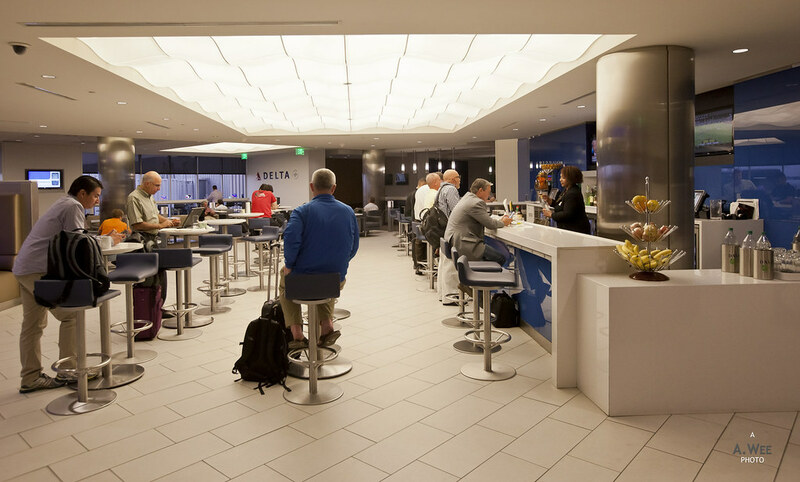 There does not seem to be anything special but the large network of Sky Clubs in Atlanta should ensure occupancy be spread out and thus the lounges does feel comfortable. I did also enjoy whatever little snacks they provided rather than nothing. 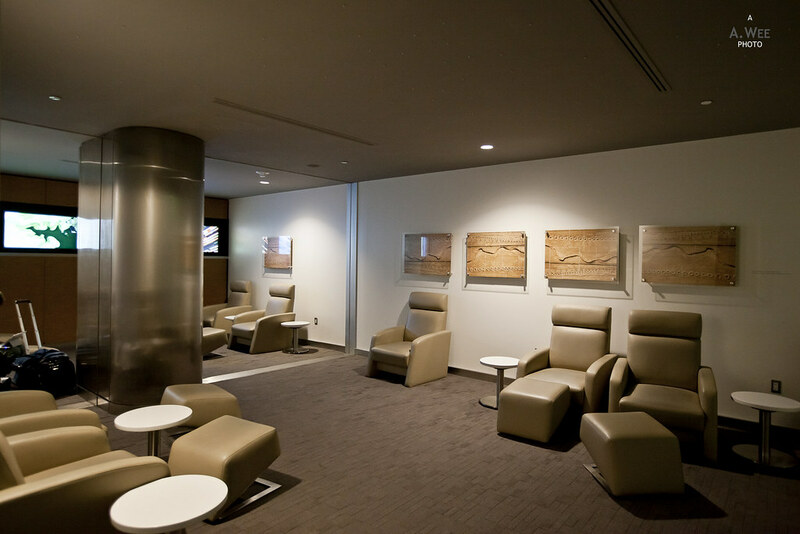 There was a small disappointment since there does not seem to be a huge range of newspapers and magazines available in the Sky Club here compared to my previous short stop in Seattle. 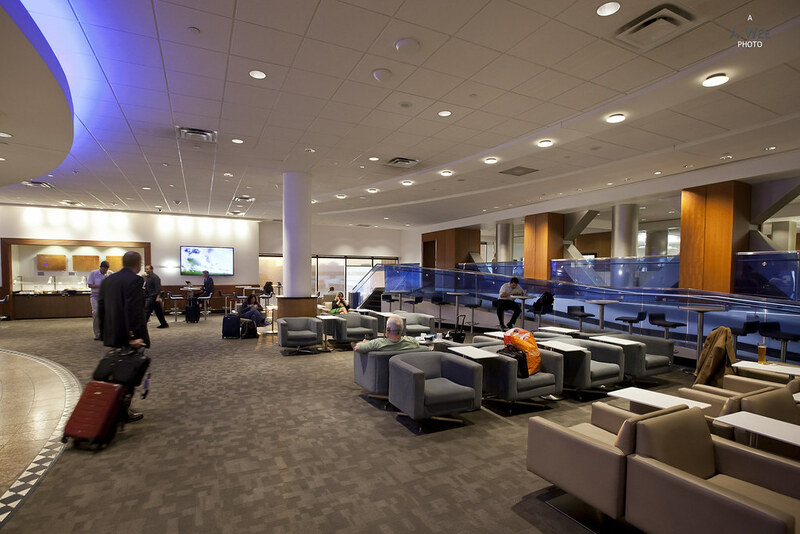 While it would not defeat the flagship lounges of other US airlines like the United Global First Lounge in SFO, it is decent for a Business Class lounge.